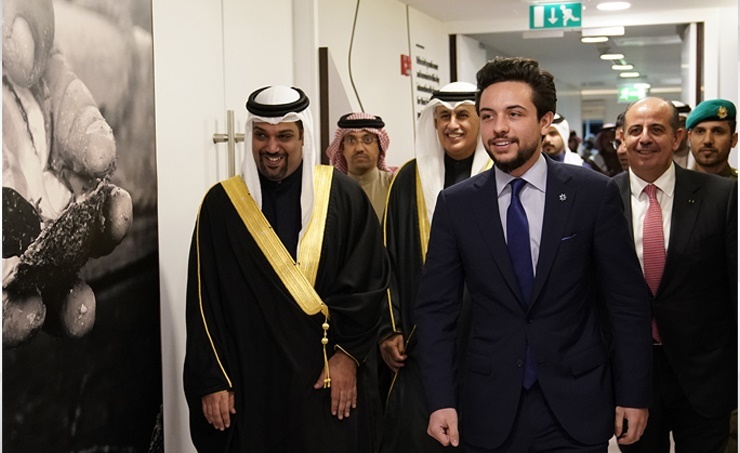 Manama, Feb. 5(BNA): His Royal Highness Prince Al Hussein bin Abdullah II, the Crown Prince of the Hashemite Kingdom of Jordan, today visited the Bahrain Institute for Pearls and Gemstones (Danat), at the Bahrain World Trade Center. During the visit, HRH Prince Al Hussein was introduced to Danat’s management, who provided him a tour within Danat’s laboratory and offices. The institute then gave a presentation on its mandates, training programs and research studies conducted by the institute as well as the history of the Kingdom’s ancient pearling industry, which dates back to centuries. HRH Prince Al Hussein was then briefed on the certification process of the pearls and precious gemstones that are sent to Danat for authentication, as well as the different types of pearls and oyster beds located in the Kingdom. HRH Prince Al Hussein expressed his pleasure in visiting Danat, and noted Bahrain’s rich heritage including its pearling industry. HRH the crown Prince of Jordan further noted Danat’s role in highlighting Bahrain’s status as a global center for the trade of natural pearls. The Minister-in-attendance the Minister of Finance and National Economy, HE Shaikh Salman bin Khalifa Al Khalifa, the Minister of Industry, Commerce & Tourism, HE Zayed bin Rashid Al Zayani, and the Ambassador of Jordan to Bahrain, HE Rami Saleh Wreikat Al Adwan, accompanied HRH the Crown Prince of Jordan on the visit.